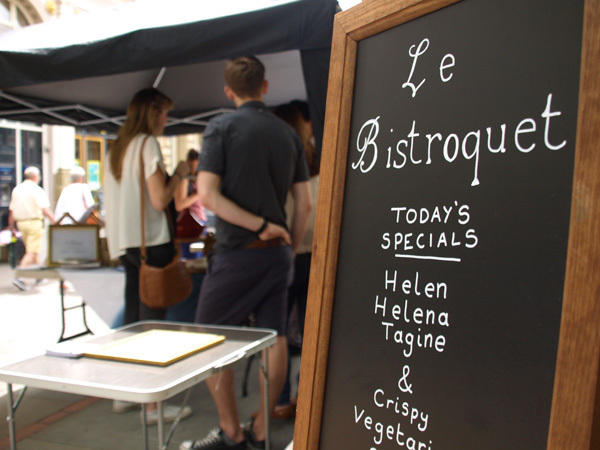 Leo Burtin’s Homemade: le Bistroquet briefly described in a previous post took the form of a market stall, yet was not about an exchange of cash for tasty bistro cooking, but an exchange of one of your recipes for this tasty bistro cooking. For me, this project was about setting up an alternative mode of economic exchange – that subverts the foregrounding of the cash exchange as the only valuable exchange between people. This work acknowledges that there other things that are of worth in life, in this case your cooking knowledge, and your desire to share your favourite recipe with others. 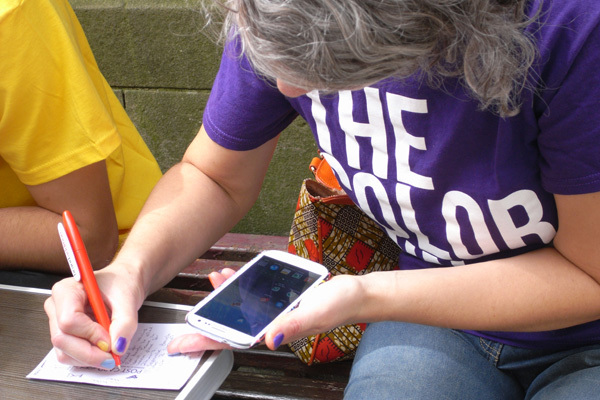 People actively engaged in writing their favourite recipes down on cards in exchange for the food on offer. The recipes are to be collated into a cookery book in the near future. However, I didn’t manage to successfully make an exchange on the day, and effectively owe Leo a recipe, as I did eat some very nice pizza. Once I realised I had to provide a recipe, I felt under pressure. I actually like cooking, but tend to make things up as a I go along a lot of the time, so writing a recipe down felt like a challenge. 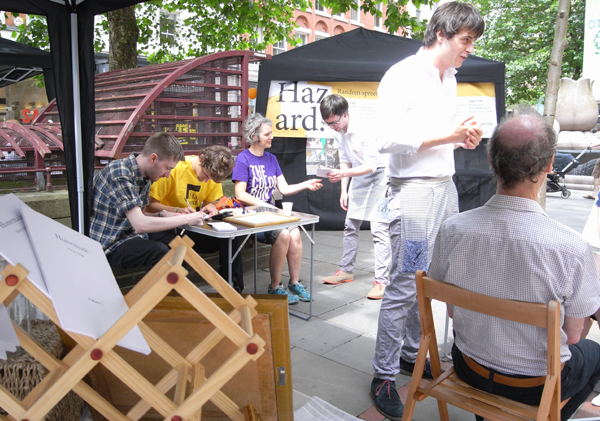 Yet, I’d partaken of the food offered, and felt guilty when I sloped off to take part in the rest of Hazard. So to publicly make reparations for this, here’s my recipe for rhubarb and blackberry crumble. Cook blackberries, rinse through and add 50g of the sugar, heat in a pan with a lid, for 5 mins. Add cooked rhubarb and blackberries to greased dish, mix gently. Rub the wholewheat flour together with the margarine in a bowl, until you have fine crumbs. Add in the oats, and 25g sugar and carefully pour over the fruit in the bowl. Cook in the oven for 20 minutes, until the top is brown, and the fruit bubbling a little.